Wonderful people surrounded us then and surround us now, rooting us on. Mawiage. Mawaige is what brings us togever today. Mawiage - that blessed awangement, that dweam within a dweam. A few years ago, I wrote a letter to the children about marriage; I posted it here. I'd still say all of it, though, with four and half more years has come four and a half more measures of wisdom. Just eleventy thousand measures left to gain. Paul and I have been married nine years today, and we are learning, daily, what it is to be married. I imagine we'll be learning that until sixty-six years from now, when we've reached our diamond anniversary. And then we'll die happy and not care anymore about learning how to be married. He's been making that face at things I've asked him to do for nine whole years now. One principle about marriage that has struck me recently is the bravery it requires. 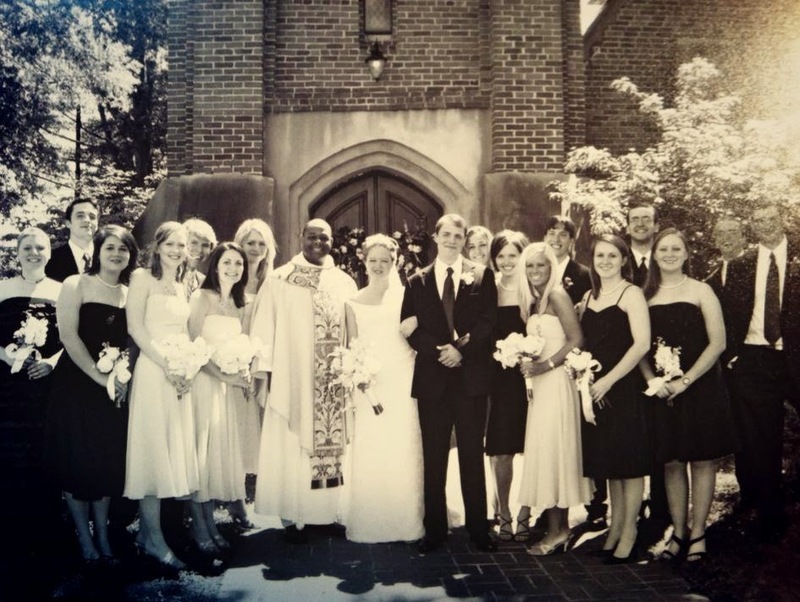 Father Ollie Rencher, who married us those many moons ago, preached our wedding homily on courage and bravery. Because we were twenty-one years old and courage is an acceptable homily topic, while the stupidity of youth is not. We were so stupid, though Ollie didn't say it or mean it. Marriage is bravery, though. It is courage. It is not the bravery and courage of knights or generals. It is the bravery of the martyrs. The courage of marriage is a willingness to die daily. I married a good man - like a shockingly good man - much better than I, and he dies to self every day. He loves his church, his children, his cities (both the one we live in and the one for which he works), his friends, his house. He loves me more though. And the bravery comes when we'd rather have a different order of priorities. I love my children, St. Augustine School, my friends, my church, but I love Paul Forster more. Or at least I'm called to love him more. Bravery is daily arranging the priorities correctly. Why is this courageous? Because sometimes we don't deserve that love. We aren't loveable. And to love someone is to be vulnerable to him. And so, every day, whether Paul is awesome or not, loving him is putting him above all else and therefore making myself vulnerable to his non-awesomeness. And doing that with the joy required, well, makes the knights and generals look a little bit pale and pitiful. We said marriage vows nine years ago today, and we meant them. You know, like children mean promises around Christmas. But, every day since then, we've had to mean them again. It is only through an undeserved measure of God's grace that we can enter into the terrifying gap of the permanent reordering of our priorities. But, it must be done. bravely gone where many men and women have gone before. New every morning. And this brave entering has returned to us a measure of happiness that no one deserves. Today I give thanks for a homily that rings in my ears, for a husband who looks at me as a partner in all things, and most for a Lord who has chosen to bless the idiocy of a couple of kids. Cheers to Paul William, the best husband in the galaxy.